Loss is an inevitable part of life and grief is a natural part of the healing process. Grieving allows us to work through the myriad feelings engendered by significant losses. The resources and links in this section have been selected to help you make the necessary steps toward healing. Losing a Child...Losing the Future? Please click here for a link to books on bereavement and grief. As a result, they are more understanding of what the loss may mean to others, and they are able to show empathy. Children in the upper end of this range not only need support and comfort, but also can be a source of support and comfort for others. Opportunities to be helpful to others during the crisis can actually help children deal with their own feelings. Children see the evidence that livings things die in many areas of their lives. They see and hear about it on the television, in movies--even cartoons, and on an ordinary walk in the park or to school, e.g. a dead bird, a squirrel, or other small animal. They notice the change of the seasons as plants and trees appear to wither and die. you'll probably experience three distinct phases of grief. People who have children often feel that parenting is life’s most important role, regardless of the child’s age. Therefore, the death of a child can be a tremendous assault on a parent’s very identity. If your child has died, you will most likely experience several common reactions of bereavement. However, your grief can be more acute than normal. You may go into periods of shock and denial. You will likely become depressed. If you are normally a committed, caring person, you could find that you do not care about anything or anyone. You may find yourself preoccupied with the circumstances of your child’s death, recreating them over and over again in your mind. You may think you see or hear your child. You might have dreams and nightmares about them. The intense grief caused by your child’s death can take a physical toll as well. You may lose weight, have difficulty sleeping, become irritable or listless, or feel short of breath. Grief has even been known to cause hair loss. Perhaps the most acute feelings you will experience are anger and guilt. Because the death of a child does not follow the normal order of nature, there is a strong urge to place the blame on someone or something. You may be angry at the doctors or nurses who could not cure your child’s illness, or at God for "letting" your child die. If your child died because of a traumatic accident, you may be angry at whomever you believe caused it. If your child’s actions partly caused the death, you may be angry at him or her and then feel guilty about your anger toward your child. You may feel the most guilt because you believe you should have prevented your child’s death. You may find yourself consumed by thoughts of "if only." A father tends to suffer guilt over failing to prevent a child’s death. While both parents feel responsible for their child’s safety, men have often been taught that protecting the family is their primary role. While bereaved parents know they will experience intense grief, their child’s death can have another effect they did not anticipate. The death could alter their feelings toward each other. Almost always, the marriage will never be the same. The change could be for the better or for the worse. However, the relationship rarely stays the same. Fathers may have a more difficult time expressing their grief, believing on some level that "big boys don’t cry," or that they need to be strong for their surviving family. Unfortunately, this may keep fathers from working through their grief and resolving it. It may become necessary to seek counseling or spiritual help. Couples may experience difficulty in communicating after the death of their child. The intensity of grief comes at different times for each parent. One parent may use work as an escape while the other finds solace in photo albums and home videos. Dad may feel the need to box up and store the child’s personal belongings while Mom cannot bear to look at them. A physical resemblance to the dead child can also cause difficulties between the parents. A child’s death may cause sexual problems within a marriage as well. Time, patience, and communication are key elements to resolving these problems. It is not uncommon for these effects to last up to two years or more following the child’s death. Your other children will look to you to explain the death to them. A child’s questions will depend on their age, but your answers should always be honest. Guard against telling children that their brother or sister is "sleeping," or that "God wanted their brother or sister." These may simply cause other fears in your children that may be more difficult to resolve than a more direct answer. Be direct, without offering more information than necessary. Young children sometimes fantasize that they caused the death by being mean to the deceased sibling or by fighting with them. In this case, it is important to assure your child that he/she had nothing to do with their brother’s or sister’s death. It is important for parents to realize that severe grief can make them feel like they’re going crazy. If you are afraid your grief is out of control, you might consider asking your clergy, doctor, or funeral director to suggest a counselor. You may be relieved to find that your problems, in this situation, are normal. If your spouse has died, you will probably experience some of the common symptoms of grief. You will very likely go into shock and denial. You may experience feelings similar to what an amputee goes through, where they actually "feel" pain in the missing limb. In the case of a lost loved one, you’ll “see” them sitting in their favorite chair or coming through the front door. This "phantom" pain may manifest itself in hearing their voice calling from another room. Their cologne or perfume lingers in closets and throughout the home you shared, evoking powerful feelings. You may feel "numb," like a spectator watching events unfold. This is nature’s way of protecting you from what is happening while your life is in transition. You may also find yourself filled with anger. You may feel angry at the doctors or nurses who couldn’t save your spouse, or maybe even with God. You may feel anger toward your spouse for leaving you, and then feel guilty for this anger. cannot change what has happened to me." "Oh God, what am I going to do now?" A course of grief recovery depends partly on your age and mostly on your individual situation. "Empty-nesters" feel the effects of a spouse’s death in other ways. The fact that the house is completely empty now, precipitates an entirely different level of loneliness. This is especially true in marriages that have lasted many years, where plans for a long and enjoyable retirement were disrupted by a spouse’s death. Losing your life companion can leave you feeling confused and panicky at any age. For this reason, you should delay making any major decisions. Try to postpone them until you can think more clearly and have a better idea of how your life is going to change. Antoine de Saint-Exup’ery wrote, "... you cannot plant an acorn in the morning and expect that afternoon to sit in the shade of the oak." You have grown accustomed to living a certain life-style and engaging in favorite activities with your spouse. You are used to being the object of your spouse’s love. For example, a woman who becomes a widow didn’t just lose her husband. She lost her best friend, her confidant, her "knight in shining armor." It is important to express your feelings. Take time to cry. Don’t be afraid to share your tears with others. Express your anger when you feel the need. Talk openly with family members and friends; this is a time to lean on them. Some of your friends may feel awkward for awhile because they don’t know how to talk to you about your loss. You can help them by simply telling them what your needs are. Don’t try to protect your children or other family members by hiding your sadness. If you normally have a pressing schedule, try to lighten it. Remember, grief is mentally taxing; you do not need the added strain of too much to do. Set aside some quiet time for yourself, time when you can think about your spouse’s death and put things into perspective. Accept a few invitations to be with close family or friends. Choose the ones that sound most appealing at the time and avoid the ones that feel more like obligation. Share your favorite stories over dinner. Make a toast or light a candle in remembrance. Make a donation in his or her name. Take a meal to a homebound couple. Volunteer in a shelter or soup kitchen. "Adopt" a family to buy presents or food for. If the idea of holiday shopping overwhelms you, buy gifts online or through catalogs. Prepare yourself for January. Sometimes the aftermath of the holidays can bring more sadness than the holidays themselves. "At least he's not suffering anymore"
"I know you'll miss him." Life Is Goodbye, Life Is Hello: Grieving Well Through All Kinds of Loss by Alla Renee Bozarth, et al. Healing Your Grieving Heart: 100 Practical Ideas by Alan D. Wolfelt, Ph.D. 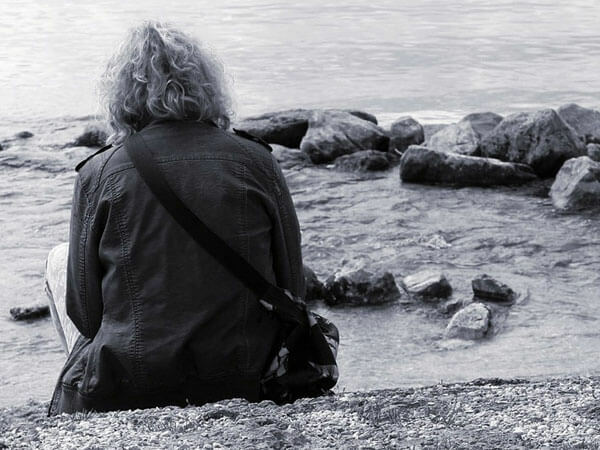 Helping Your Grieving Heart for Teens by Alan D. Wolfelt, Ph.D.